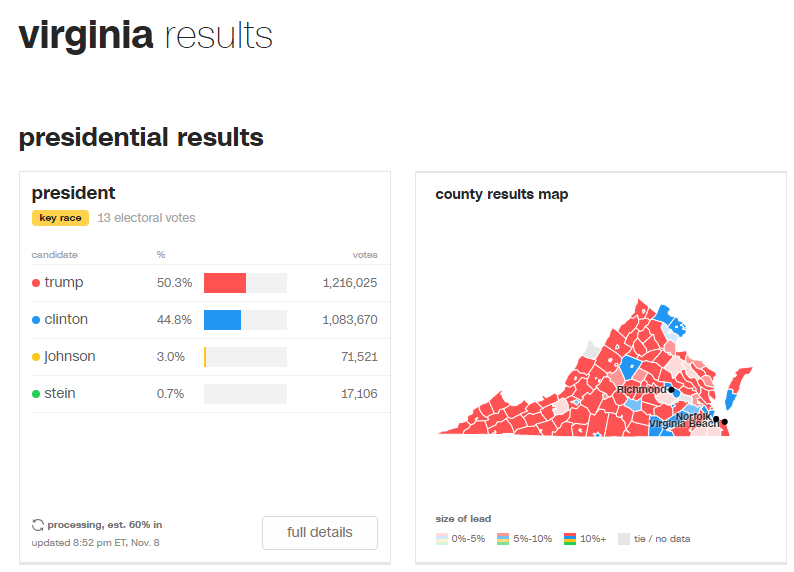 HILLARY TAKES LEAD IN VIRGINIA! Up 6,000 Votes with 82% Reporting -- RCP Had Hillary with 5% Lead in Polls! HILLARY TAKES LEAD IN VIRGINIA! Up 6,000 Votes with 82% Reporting — RCP Had Hillary with 5% Lead in Polls! WITH 60% OF VOTES COUNTED DONALD TRUMP LEADING IN VIRGINIA! This was supposed to be a SOLID Hillary state. Trump leads Hillary Clinton by 6 percentage points. FYI— Real Clear Politics had Hillary Clinton leading Trump by 6% this morning! They were off by 6 percentage points!